Kolkata, February 3: Showing immense distress, West Bengal Chief Minister Mamata Banerjee has once again stopped to another level of undemocratic rule. 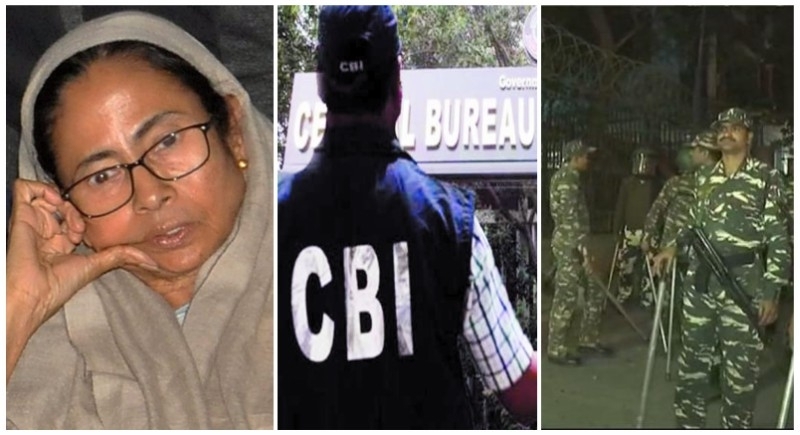 The Kolkata police on Sunday detained a team of the Central Bureau of Investigation (CBI) that arrived to question city commissioner Rajeev Kumar on the chit fund scam case. In order to control the ongoing political crisis in the state, the Centre ordered the deployment of Central Reserve Police Force (CRPF) units at CBI regional office at CGO Complex in Kolkata. The ongoing tussle between the Centre and Mamata Banerjee-led TMC government with regard to CBI raid at police commissioner Rajeev Kumar has turned into a full-fledged political crisis. The decision comes after five CBI officials were detained by the Kolkata Police and were allegedly manhandled by the cops. Working according to the orders given by the Supreme Court, the CBI team were conducting the raids. Reacting to Mamata Banerjee’s claim of not carrying any warrant before conducting the raid, Joint Director Kolkata Pankaj Srivastav said that while getting the warrant there is a high probability that the information will get leaked so the officers did not carry it. Adding up to the many flaws, CM Mamata Banerjee did not allow UP Chief Minister Yogi Adityanath to conduct rally in West Bengal. In retaliation Uttar Pradesh Chief Minister Yogi Adityanath has dared the Mamata Banerjee government in West Bengal to prevent him from coming to the state on February 5th. UP CM Adityanath addressed the rally remotely via phone. He also attacked the West Bengal chief minister comparing track record of being democratic and non-communal in his and Banerjee's respective states. He said, "I have to go to West Bengal again on February 5, it is my right, and for the people of the state, it is our right to raise our voice. It is our responsibility to protest democratically against an undemocratic West Bengal government." "If there is a lack of law and order in the state, the government has no right to be in power. Uttar Pradesh is the biggest state, and the state has got stability because of me. Mamata Banerjee should learn how to maintain law and order from Uttar Pradesh," he added. Covering up the Commissioner, CM Mamata Banerjee is trying hard to save him so as to cover up the scams which have been into limelight exposing her government. The level to which Mamata Banerjee has stooped and her distress over the issue highlights how desperate she is to save her power in the state fearing to lose the mandate.